Pet Wants Cuyahoga is currently available in Hudson, Solon, Chagrin Falls and the surrounding areas through free, convenient, personal delivery service. The Northcrafts are planning to open a storefront in the near future. 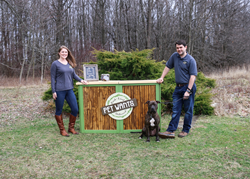 Lauren and Andrew Northcraft have been happily feeding their dogs Pet Wants for close to 10 years, so when the opportunity to open their own franchise came along, they jumped at the chance. Now the two are pleased to announce the launch of their new business – Pet Wants Cuyahoga. Pet Wants’ specially crafted pet food formulas are made in small batches with fresh, natural ingredients enhanced with vitamins and minerals for a complete and balanced diet in every bowl. Pet Wants Cuyahoga offers multiple blends of dog and cat food formulas as well as healing salve, calming balm, anti-itch spray, paw wax and more. Pet Wants Cuyahoga is currently available in Hudson, Solon, Chagrin Falls and the surrounding areas through free, convenient, personal delivery service. The Northcrafts are planning to open a storefront in the near future. Lauren and Andrew have three children and three dogs – Moose, a 10-year-old Shar-Pei; Monroe, a 7-year-old Dutch Shepherd; and Beau, a 3-year-old Pitbull mix. They are both Ohio natives and they met at Xavier University in Cincinnati. The Northcrafts heard about Pet Wants when founder Michele Hobbs opened the first store at Cincinnati’s Findlay Market. Moose, who was only six-months old at the time, had been diagnosed with the genetic condition Familial Shar-Pei Fever, and the Northcrafts were trying to find ways to help him live a longer, healthier life. “Moose can’t digest proteins correctly and, when he’s stressed, it gets much worse. With his separation anxiety, the vet told us he probably wouldn’t make it to age 3 and would never make it to age 6. That’s when we started looking at things we could do to help. We knew a different kind of food wouldn’t be the only solution, but it would certainly play a big role in helping Moose live his best life. That’s how we found Pet Wants and, this year, Moose is 10,” Lauren said. After they started feeding Moose the Pet Wants food, Andrew, who was in the entrepreneurial program at Xavier, asked Hobbs if Pet Wants had room for an intern. Within a couple of weeks, Andrew was moving palettes of food and making deliveries. The Northcrafts have been part of the Pet Wants family ever since. To learn more about Pet Wants Cuyahoga or to place a delivery order, call (234)380-2849, email LNorthcraft@PetWants.com or visit http://www.PetWantsCuyahoga.com.